Wouldn’t you like to saddle up with peace of mind? At Southern Breeze Equestrian Center, Inc., you can breathe a sigh of relief while learning to ride any one of our amazing animals! Start from the ground up or sharpen you riding skills at one of the best riding academies in Houston, at SBEC’s beautiful facility in Fresno, Texas. Put the best horseback riding lessons in town to the test. Our thorough and structured lessons are available as private lessons or small, leveled groups. Our experienced instructors work as a team to ensure consistency in our lessons and a very thorough education. Each rider learns ground skills, along with riding skills to become a true horseman. Let us help you polish your skills in hunt seat equitation, show jumping and dressage on your horse or ours. As a PATH INTERNATIONAL registered equestrian center, we provide people with various levels of physical, mental & emotional disabilities a wonderful way to enhance their lives. 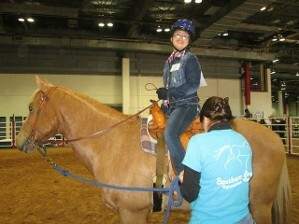 Therapeutic riding has been shown to stimulate the brain to help with speech, focus, and mental organization. Let our positive staff help your special needs rider to improve balance, strength, and coordination. Our instructors and volunteer side-walkers work as a team to assist each rider, build confidence & make the ride fun. The unique relationship you establish with your horse helps improve your interpersonal relationships and physical skills. Clinics are available to help parents and volunteers understand the benefits. 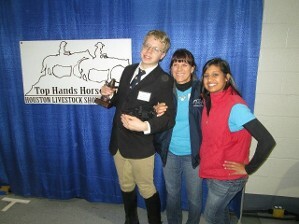 Contact us to begin your horse riding lessons or therapy sessions.